Name 3 things you can do to improve your gut health. How about take a probiotic? Maybe use a supplement like l-glutamine? 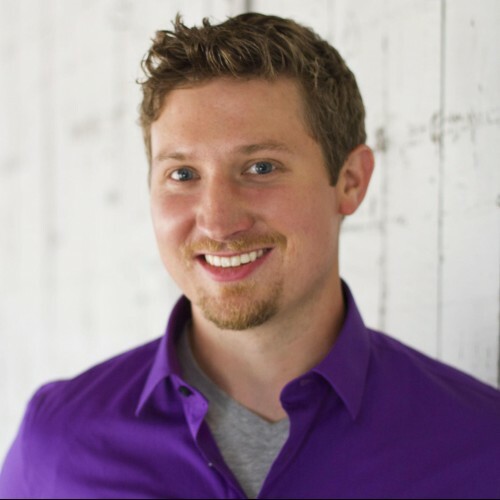 Drink a cup of bone broth every day? But there’s something else I use to boost my gut health, my immunity, and overall sense of happiness and well-being. You might use it too, and not even realize it! It weighs about 80 pounds. It’s got a long, wet tongue. And it loves nothing more than a belly rub. Pet ownership has myriad health benefits – not limited to improving the diversity of the microbiome (aka your gut health!). 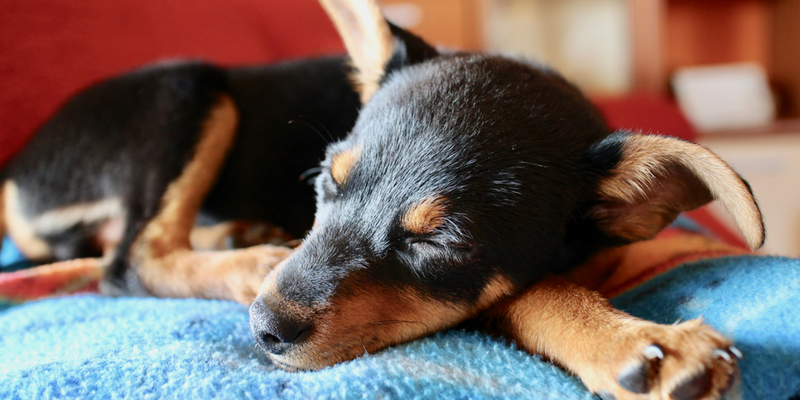 Today, I’m excited to share a few of the health benefits of pet ownership – and what you can do to return the favor and keep your pet happy and healthy, too. It’s one of those things you might have heard your grandma say, or on the playground as a kid when you dropped your orange slice. Like the phrase “gut instinct,” its roots are likely in the ancient wisdom humans had about their bodies and the planet. Today, you’re less likely to hear that a little dirt won’t hurt. Instead, you’ll be encouraged to “disinfect,” “cleanse,” and “sanitize” everything from your laundry to your toilet to your food. Oversized bottles of hand sanitizer are ubiquitous in classrooms. Every grocery store has antibacterial wipes available to use on the carts. But the war on germs has had unintended consequences. Despite the world getting cleaner, incidences of allergies and asthma have only increased. The leading theory for why? It’s called the “hygiene hypothesis.” It suggests that by over-cleaning, we have prevented our immune systems from learning how to respond properly to threats. Even the FDA has caught on to what a problem over-cleaning is – just this year, the antibacterial triclosan was banned from soaps and personal care items. What we need is not to live in a “clean” or allergen-free world, but rather to be exposed to allergens and dirt so we adapt to fight them off. It turns out, a little dirt might just not hurt – it may help! What Does The Hygiene Hypothesis Have to Do with Rover? Aside from offering love, companionship, and free kitchen-floor-cleaning services, pets can improve our lives in one other way. Pets are dirty. My dog loves nothing more than rolling in the grass. My sister’s dog will plunge headfirst into a muddy puddle any chance he gets. And while my 21st-century-human instinct is “Now he needs a bath!” the truth is that being “dirty” is both natural and healthy for pets and their owners. As people spend less and less time outdoors and in direct contact with dirt themselves, pets act as liaison between humans and dirt. Your dog rolls in the grass, then you hug your dog. The result? Less allergies and asthma for you. It’s this “dirt” – or more specifically, the dust and dander created by dogs – that contributes to reduced allergies and asthma in their owners. A 2013 study conducted by the Tufts School of Medicine showed that early-life exposure to dogs was protective against allergies and asthma. Exposure of mice to dogs led to a distinct gut microbiome composition that was especially high in Lactobacillus johnsonii, which was protective against asthma. This means that having a dog can impact the gut microbiome – and that change in the microbiome can mean fewer allergies and less asthma. Further studies, like this one conducted by the American Heart Association point to a probable association between dog ownership and decreased cardiovascular disease rates. While the study can’t prove a causal effect, we can assume that owning a dog can decrease CVD risk because people who own dogs are more likely to engage in regular exercise – all that dog-walking. Another theory is that CVD risk decreases because of the stress-relief and companionship pet ownership provides. Either way, the link between owning a dog and improved blood pressure, lower cholesterol, and decreased risk of heart attack exists. Your dog provides you with unconditional love AND health benefits. In exchange, he just wants a belly rub. But, in addition to lots of love, you can also strive to take the best care possible of your pet, so that they can live a long, healthy life. Chicken, whole grain corn, barley, rice, chicken by-product meal, whole grain wheat, corn gluten meal, beef tallow preserved with mixed-tocopherols, soybean meal, oat meal, poultry by-product meal, glycerin, egg and chicken flavor, mono and dicalcium phosphate, calcium carbonate, salt, potassium chloride, poultry and pork digest, avocado, dried carrots, dried tomatoes, MINERALS [zinc sulfate, ferrous sulfate, manganese sulfate, copper sulfate, calcium iodate, sodium selenite], VITAMINS [Vitamin E supplement, niacin, Vitamin A supplement, calcium pantothenate, pyridoxine hydrochloride (Vitamin B-6), Vitamin B-12 supplement, thiamine mononitrate (Vitamin B-1), Vitamin D-3 supplement, riboflavin supplement (Vitamin B-2), menadione sodium bisulfite (Vitamin K), folic acid, biotin], choline chloride, L-Lysine monohydrochloride, Red 40, Yellow 5, Blue 2, garlic oil, Yellow 6. These ingredients not only don’t support a healthy gut microbiome in your dog, some of the ingredients actively harm a healthy gut. And foods like soybeans, corn, and whole wheat have no place in a dog’s natural, carnivorous diet. And unfortunately, Beneful isn’t even one of the worst foods you can feed your dogs – it’s just part of the SADD (Standard American Dog Diet). Yes, these issues are all related to diet – because diet is the foundation of gut health, and gut health is the foundation of whole-body-health! (This applies to pets and to people – if you need help with finding the right diet for a leaky gut, click here). You may want to consider if a raw-food diet would be right for your pet (this article can help you figure that out). 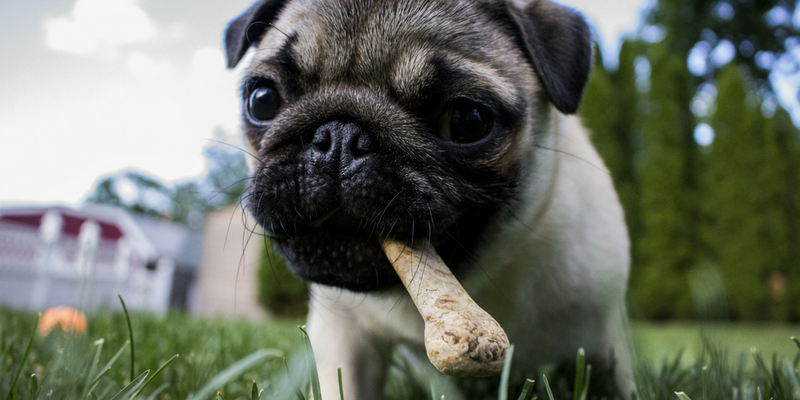 Just as humans benefit from the healthy boost of bacteria, so do pets. In addition to a high-quality diet, the best thing you can do for your pet is supplement with probiotics (especially important if you’re feeding prepared foods, which contain less beneficial bacteria than do fresh foods). A daily probiotic supplement can help improve the health of the microbiome. My vet recommends either a daily spoonful of homemade yogurt, or a special pet probiotic like Full Bucket Daily Dog Powder. Your dog’s skin and coat are home to hundreds of thousands of good bacteria that help keep him clean and healthy. This is the “skin microbiome” – similar to the gut microbiome. 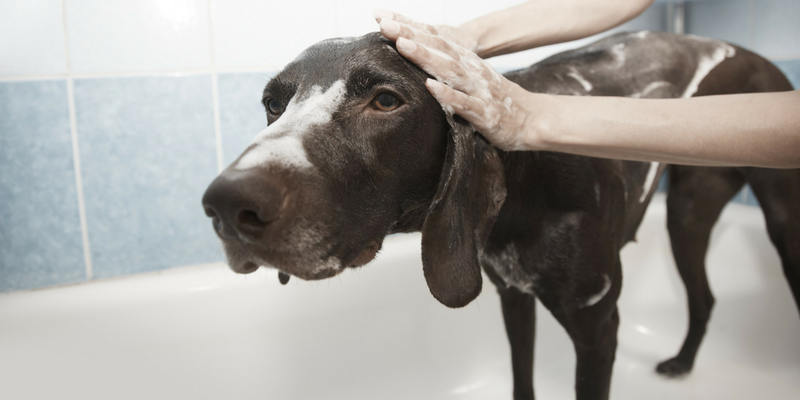 Dogs aren’t meant to have a daily bath, as over-bathing can disrupt the skin microbiome, which controls shedding, oil production, odor, and more. 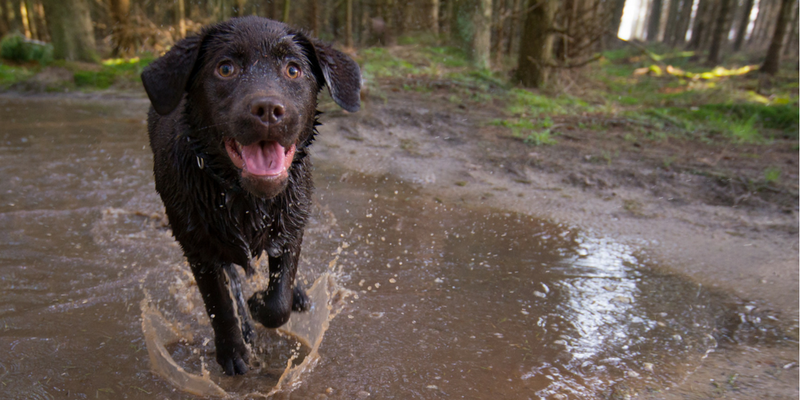 Being “dirty” is part of what makes them dogs – and part of what helps them keep you healthy, too. Over-washing can actually make your dog stink MORE – as the natural oils are stripped from the skin, your dog’s skin microbiome will respond by producing even more oil. A dog with a healthy gut and skin microbiome (from proper food and probiotics) doesn’t need frequent baths to be clean. Instead, give your dog a thorough brush at least once a week. This helps distribute oil through the fur (making it shiny and smooth), gives you a chance to check for potential issues, and helps you bond with your pet. But, occasionally your dog does need a little more than just brushing – especially if they are inside. Because my dog likes to sleep at the foot of my bed, it is important to me that he is clean. However, I won’t use any “dog shampoo” on my pet – the harsh solvents and cleaners in dog shampoos leave my dog itchy, his fur dull, and he’s stinky again in just a few days. These symptoms are all signs his skin microbiome has been disrupted by soap. Instead, I use a spray specially designed to clean without disrupting his microbiome. It introduces powerful, “good” probiotics to his skin microbiome that help keep him clean, shiny, and happy. I think of it like a probiotic supplement for his fur! With regular brushing and use of the Petbiotics spray, I find my dog rarely needs a true bath. When he does, I use a natural, extra-gentle shampoo like this one. (Pro tip – I also use this spray on anything he lays on – like my bed, and even his favorite sunny spot of carpet. For anything that can be washed, I use the Petbiotics Clean Home Concentrate. I love it because I know that even if my dog licks or chews whatever I washed, he’s safe – there are no harsh chemicals. I even use this to wash his plush toys). Having a pet is a big commitment. While we would never advocate getting a pet just because they can improve your health, knowing that my dog makes me healthier makes me appreciate his presence in my life even more. P.S. – Right now, you can save 25% on the same products I use to keep my dog Gus clean and healthy! Use this link and the code “PET25” when you purchase any Petbiotics products to access the discount. Wow! I know my dogs keep me healthy. This is such good information. With two young energetic huskies I’m constantly hiking and walking. Our time spent in the forests of Western North Carolina feed my psychi like nothing else can. Hi there, thank you for this article. I am glad that there is other people in the world that feel the same way. I believe that children must grow up with a pet or 2. This forms there character in a good way. My daughter and her family has 8 dogs. From a Great Dane to a Toy Pom and all of them are adorable. My children and grand children grew up with animals. They are a great comfort to us. The smaller dogs are all sleeping indoors.We love our dogs. I have 5 dogs and walk them 3 times a day.. They keep me motivated to keep moving.